In the storage room – Corey and Vic congratulate Paul on winning HOH. 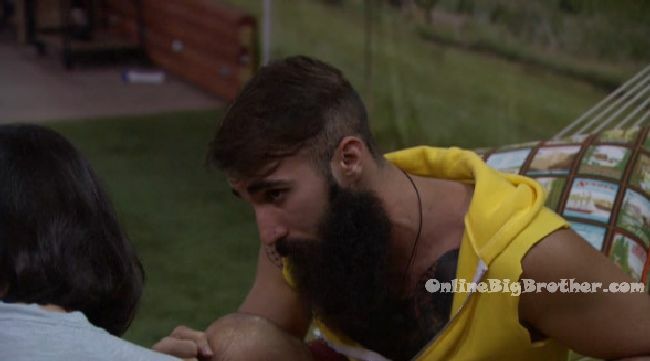 Pual says I didn’t really want to win it considering next week might be a double eviction. Paul says I’m going to want a boy going up as a pawn next to her. I want a guy playing in the veto next to me against her. Vic says I don’t feel comfortable going up considering I just came back. Paul says we’ll talk about it. James wins the HOH beating out Bridgette after a 5 hours battle. Bridgette had made a deal with James if she dropped he wouldn’t put her or Frank up. James made the deal “on the wall” so she dropped. He put Bridgette and Frank up anyways. Nobody seemed to care about this at the time sans Bridgette, Frank and a bit of Natalie (and fans of James, Frank and Bridgette). The 5th week of Animated Gifs For Big Brother 18. My favorite is probably the Corey Victor ones showing thier budding showmance. Gif’s in no particular order..
2:10am Paul goes to get in bed in the London bedroom. Michelle starts laughing. He then smells the baby powder all over the bed. Paul says you motherf**ker!! There is so much baby powder on my side of the bed. All you pieces of sh*t! You f**king a$$holes! I knew it! He gets up and turn on the light. You peices of sh*t. Michelle says its all over your back, your leg. Paul says your boy goes to the DR and comes back .. GHOST! Talking about being jealous about Nicole and Paulie. Apparently she saw him lay his leg over her legs while she scratched his hair. Zakiyah – I’m just territorially.. You know what i’m saying.. Once I pee on my tree..
Zakiyah – I play games.. I play dirty..
Frank – i’m just too good at this..
5:05pm Bedroom – Frank and Bridgette. Frank says I’m tired of talking about those stupid f**king tickets in the DR! Quit trying to get my hopes up. I don’t know about you but the way they talk about the damn house and that whole riddle thing… makes me think the whole house is against us. Bridgette asks what the riddle thing? Frank says the secret thing. Bridgette asks that tickets? Frank says yes. James – Next week should be real easy as long as Bridgette doesn’t win.. If Bridgette doesn’t win we have another week of coolness. 12:10am Paulie and Paul playing chess. Meanwhile out in the backyard – Nicole is talking to Da. Nicole asks has Frank tried to campaign to you at all? Da says no. Nicole says same but he’s making me uncomfortable. Da says I’ve heard he’s been talking to everybody else. Nicole says me too. Da asks did he campaign to Corey? Nicole says yeah .. and he told him not to trust me! I’m dunzo with him! 5:20pm In the hammock – Frank & Bridgette. Frank says if I do get evicted on Thursday .. I hope one of us has the return ticket! Bridgette says that Michelle was shouting there a 1 in 12 chance and said its never number 1 .. who has that ticket!? Bridgette says that’s me, thanks! Frank says she’s the worst .. her and her temper tantrums. Frank says I don’t care what the live feeders think. 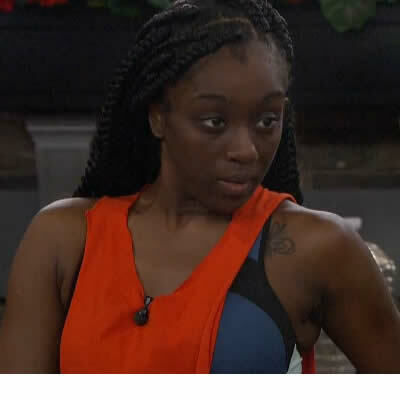 Da’Vonne – They need 4 and James will break the tie, he’s voting Frank out.